PUBG just cannot stay out of the news right now, not that this is a bad thing for maker Tencent of course. The latest news comes after the official PUBG Mobile Twitter account shared news today that Dogtags are now part of the PUBG Mobile experience. According to the tweet and accompanying image, gamers can expect to be able to pick up Dogtags for a range of different things including completing matches, killing other players or simply just logging in. While it is not entirely clear at what rate the Dogtags will be handed out to players but no matter how often they do get their new Dogtags, they’ll be able to swap their new tags for in-game goodies that will let them trick their characters out, adding new clothes and accessories as they go. 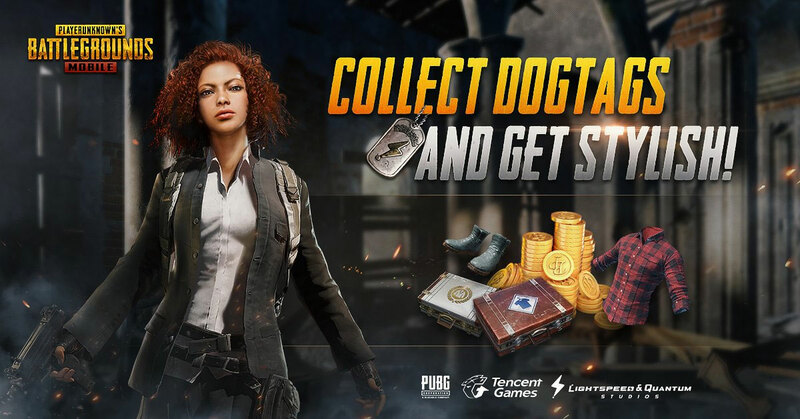 The addition of Dogtags to PUBG Mobile is just the latest change that sees the mobile version of the game gain additional functionality that gives it more of a feel of a fully fledged game rather than a stripped down smartphone version of something which is a much bigger, more feature rich experience. Both PUBG and Fortnite, the competition in the marketplace right now, continue to grow and that’s likely to be key to their ongoing success. We told you recently how Fortnite itself has today received a new update which adds new weaponry and fixes bugs, further highlighting the developer’s commitment to providing the best experience possible. With both Fortnite and PUBG continuing to duke it out for the attention of an ever growing mobile gaming market that can only be seen as excellent news for those of us who just want great games. Really don’t see what the big deal is with this game… it will be forgotten in a few months.